The syntenic distance between two species is the minimum number of fusions, fissions, and translocations required to transform one genome into the other. The linear syntenic distance, a restricted form of this model, has been shown to be close to the syntenic distance. Both models are computationally difficult to compute and have resisted efficient approximation algorithms with non-trivial performance guarantees. In this paper, we prove that many useful properties of syntenic distance carry over to linear syntenic distance. We also give a reduction from the general linear synteny problem to the question of whether a given instance can be solved using the maximum possible number of translocations. Our main contribution is an algorithm exactly computing linear syntenic distance in nested instances of the problem. This is the first polynomial time algorithm exactly solving linear synteny for a non-trivial class of instances. 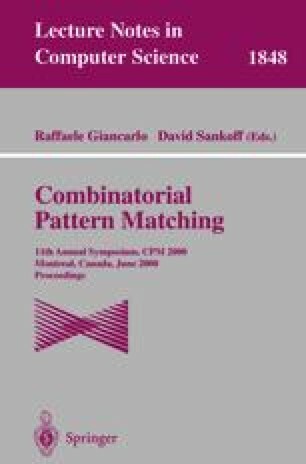 It is based on a novel connection between the syntenic distance and a scheduling problem that has been studied in the operations research literature. The author is on leave from graduate studies at MIT and is currently studying at Cambridge University. The majority of this work was performed at Cornell University. Supported in part by a Churchill Scholarship from the Winston Churchill Foundation and the ONR Young Investigator Award of the second author. Supported in part by a David and Lucile Packard Foundation Fellowship, an Alfred P. Sloan Research Fellowship, an ONR Young Investigator Award, and NSF Faculty Early Career Development Award CCR-9701399.